Uniting A Fandom of Pears In the cold winter of 2006, a pear ripened that would forevermore change the fruity landscape of the Internet. Its submission to DeviantArt by ursulav brought with it so many questions: Lol wut? Why? It eats birds? In the cold winter of 2006, a pear ripened that would forevermore change the fruity landscape of the Internet. Its submission to DeviantArt by ursulav brought with it so many questions: Lol wut? Why? It eats birds? What is that chipmunk wearing? How have we never noticed the giraffes? One of the best ones i've seen! 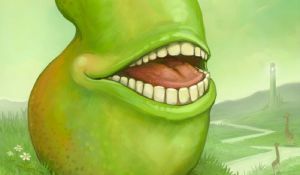 That mouth reminds me of something. I can't remember what it was, though. Hmmm. I am not sure! Maybe you will remember. Thanks! I can't take credit for the originality of the work. But it was a lot of fun to recreate. Ahaha I see. It's so good though!